"Turkle's emphasis on personal stories from computer gadgetry's front lines keeps her prose engaging and her message to the human species-to restrain ourselves from becoming technology's willing slaves instead of its guiding masters-loud and clear." 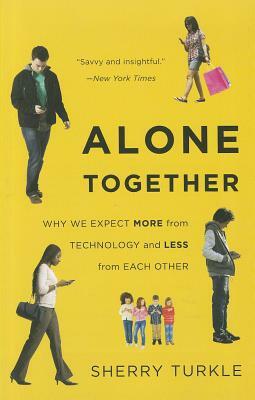 "Turkle is clearly passionate in describing what she sees as the looming social isolation being wrought by the new technology.... Alone Together does offer a needed counter to the wholesale adoption of the social media and social robot." "Alone Together stands as an entirely accessible, tantalizingly thought-provoking read.... Books like this and researchers like Turkle lending their expertise to the debate are absolute necessities." "Alone Together is a mighty fine layperson's introduction to where we are as a technological and social media society." "[Turkle's] decades of teaching technology and daily living add authority to her fine survey!"